SYRACUSE Dr. Cornelius Murphy, Jr. president of the State University College of Environmental Science and Forestry (SUNY ESF) joined Timothy S. Carey, president and chief executive officer, New York Power Authority (NYPA) outside the college's Physical Plant Building today to display the latest advancement in electric-drive technology, the DaimlerChrysler plug-in hybrid electric (PHEV) Sprinter Van concept vehicle. "Under Governor George Pataki's leadership the Power Authority has advanced a number of green initiatives. In the realm of transportation, our electric transportation program is committed to putting electric and hybrid electric-cars and buses on New York's streets, and in government and our customers' fleets. Now we are working with the Electric Power Research Institute and DaimlerChrysler to pave the way for the next big thing in automotive transportationplug-in hybrids," said Carey. "Today's demonstration of a new plug-in hybrid electric Sprinter Van is another step forward toward a cleaner, greener world. Our students at ESF made a great point with me, that we can't teach green without going green. We are trying to lead by example as you can see by the large number of alternative energy vehicles already in our fleet," said Murphy. "DaimlerChrysler is the only manufacturer to build plug-in hybrid vehicles to test with customers," said Nick Cappa, manager, Advanced Technology Communications, DaimlerChrysler. "What we're learning from this 'proof of concept' fleet will apply to future hybrid powertrain and battery technology." 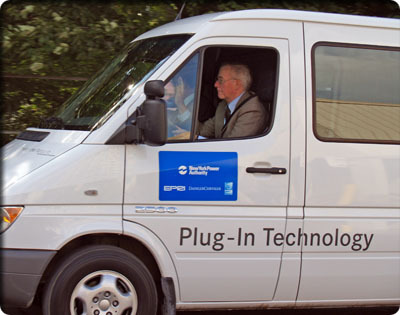 "The plug-in Sprinter Van represents a significant step along a series of important developments that will lead to commercializing Plug-In Hybrid Electric Vehicles," said Robert Graham, manager, Electric Transportation Program, Electric Power Research Institute (EPRI). "Many of the technological advantages are cleara vehicle operating primarily on electricity is a cheaper ride, air emissions are significantly lower and it reduces our reliance on imported oil." Ongoing EPRI studies indicate that fleet applications offer the best opportunity for the early demonstration of plug-in hybrids. Today's unveiling is the first in Central New York and one of a series of public events planned for New York State to highlight this plug-in hybrid electric concept vehicle. NYPA has joined an alliance created by EPRI, in cooperation with DaimlerChrysler, to demonstrate PHEVs in various fleets around the country. In 2006 and 2007, five prototype vehicles currently being tested in Germany, will be brought to the United States under a federal waiver and tested by customers for a three-year period. NYPA plans to demonstrate one of these vehicles in the fleet of The New York Times. PHEVs can operate in either an all-electric or hybrid mode. These vehicles have larger batteries than standard non-plug-in hybrids, which allow them to travel distances in the all-electric-only mode. The Sprinter Van plug-in concept vehicle has an electric range of up to 20 miles. 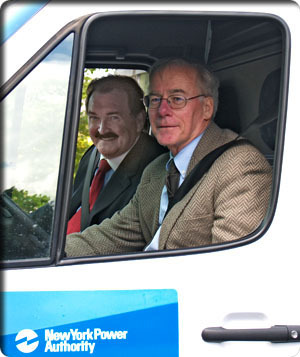 On short urban routes, with lots of stop-and-go driving, this vehicle may operate for most of the day in electric mode. In the hybrid mode, the vehicle performs like a standard hybrid, with significantly lower emissions and fuel consumption than conventional diesel or gasoline vehicles. SUNY-ESF has 34 alternative energy vehicles including bulldozers, plow trucks, buses that run on bio-diesel, electric cars, GEM vehicles, Toyota and Honda hybrids, and three flexible-fuel vehicles that are E85 equipped. NYPA is a recognized national leader in the promotion and demonstration of electric drive technologies. In New York City, NYPA worked with the Metropolitan Transportation Authority to introduce hybrid-electric buses. Over the last 10 years, NYPA has placed more than 800 electric drive vehicles in service in its customer fleets. NYPA uses no tax money or state credit. It finances its operations through the sale of bonds and revenues earned in large part through sales of electricity. NYPA is a leader in promoting energy-efficiency, new energy technologies and electric transportation initiatives. It is the nation's largest state-owned electric utility, with 18 generating facilities in various parts of the state and more than 1,400 circuit-miles of transmission lines.